Try out a TBLT—or a turkey bacon-lettuce-tomato sandwich! 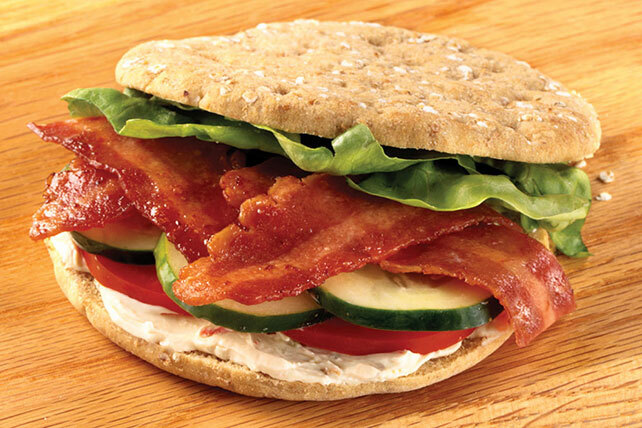 This Garden-Style TBLT includes cucumbers and veggie-flavor reduced-fat cream cheese. Spread cut sides of buns with reduced-fat cream cheese. Store-bought cucumbers are often dipped in wax to help preserve them. This wax coating can cause the peel to be bitter and tough. For best results, use a vegetable peeler to remove the peel before slicing or chopping cucumbers for recipe use.